One morning I woke up in the midst of troubled dreams that would not settle, and found myself in the midst of more midst and more troubled dreaminess, into the turbulent verminousness mid-morning of adolescence, well-documented in the Gus Van Sant film, Elephant. Late to school, but alert to World Lit Class, I was handed very few texts that would unsettle me further. But one such drug for unsettlement was The Metamorphosis. If The Metamorphosis hits you when you are vulnerable, it lodges like an apple in your dubious carapace, and stays there to shed its rotty apple-effects indefinitely afterward. The Metamorphosis is so massively culturally dispersed that it almost feels like an epic shape you can move inside of, despite its extreme brevity. Or, to re-read it is to move inside a kind of funhouse, with new and familiar (=uncanny) apparitions arising every time (and perhaps you are the wraith haunting The Metamorphosis). Or, when you re-read The Metamorphosis, it becomes a shifting topo-map, the text presenting new clefts and declivities, welling with intensities and sinking away into a diminishment one might choose to view as repose. 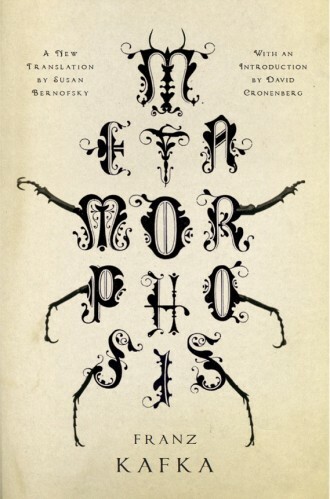 The same might be said of different translations of The Metamorphosis. The latest is that of Susan Bernofsky, the marvelously nimble translator of such contemporary German-language authors as Yoko Tawada and Jenny Erpenbeck as well as Walser and Hesse. As a translator, Bernofsky is as daring and precise as an aviatrix. One could say she pilots the English text, with Kafka’s sentences spreading out like a landscape just millimeters below. She moves us along the dips and rises in Kafka’s tone, surprising us with the swoops of its intensity, pulling us up short at its most painful moments, and landing, finely, neatly, on the ground. For the English and German texts are finally identical in the silence which follows the concluding paragraph. And when they arrived at their destination, it seemed to them almost a confirmation of their new dreams and good intentions when the daughter swiftly sprang to her feet and stretched her young body. Some survive with a young body; others, transformed into vermin, are chucked out with the trash. I admire Bernofsky’s reconstruction of the German here; the good bourgeois phrases ‘new dreams’ and ‘good intentions’ are like parcels which must be gathered up so the sentence’s pronominal passengers can disembark. Irony—gentle yet bitter as the arsenic in the apple—wells up in those pocket-like phrases ‘new dreams’, ‘good intentions’, even ‘their destination’ at which they were so lucky to ‘arrive’. Samsa himself did not enjoy such an arrival, nor did Kafka, nor did the similarly adjudged ‘vermin’ who would undertake train journeys in the horrendous decades to follow. Bernofsky’s athletic limberness, her loops and dives, the closeness with which she rides the subtle curves of Kafka’s sentences and his logics, makes present Kafka’s own virtuosity, so easily grasped in this short, digestible work. Yet the way she, like us, like Samsa’s sister and parents, can pilot away, can spring up from this text, where Samsa could not, calls to mind the precariousness of intimacy, of music, of talent, of communication, of all the little compensations for our verminous human existence.